Data Security & Erasure | HOBI International, Inc.
Corporate information security is one of the leading enterprise tech concerns due to increasing reports of data breaches worldwide. Compromised enterprise information can lead to expensive recovery fees, legal repercussions and lost investor, employee and customer trust. HOBI prioritizes our client’s information security in each of our service offerings. We provide fully traceable data destruction that prioritizes our client’s data’s security while processing equipment efficiently and securely for minimum downtime and maximum turnaround. 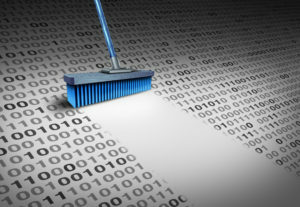 A regularly overlooked, but imperative, aspect of data security is the destruction of residual data. Devices available for resale or recycling may still contain personally identifiable information (PII) from a previous owner. HOBI offers NIST-compliant data erasure tools to ensure all PII is properly and securely wiped from a device, and client information security is ensured. HOBI’s on-site and remote data erasure services ensure peace-of-mind during device processing. HOBI Shield® is NIST-compliant and has been verified by forensic data specialists as a trustworthy system for completely removing data from devices. Upon receiving devices, HOBI provides this service at no additional cost to clients. Once HOBI receives client hard drives and media for processing, the devices are sent through a rewrite procedure. HOBI uses an internally-developed, NIST-compliant data erasure tool called the HOBI Shield® that completely disposes of stored data. HOBI Shield® ensures software and data on the device is not reused or recovered without any additional cost to clients. HOBI also offers a full overwrite, or DOD-compliant wipe on data storage devices upon client request. This level of wipe provides a higher degree of data security, but will require additional time to process the device. If the technology HOBI receives is not up for resale, either due to market value or client request, HOBI destroys the devices through shredding technology for ultimate data security. HOBI also utilizes shredding technology for any defective hard drives, and devices marked for destruction. Once devices have been shredded, they are recycled.